Even though earthquake preparedness is more than just having an emergency kit, your emergency supplies are clearly a crucial factor in how you fare during the first week or more after a large earthquake or other regional disaster. That’s why several of the recent articles in this blog have focused on expiration dates, or lack thereof, of your emergency food and water supplies. However, there are other supplies in your kit that expire, like your batteries, so let’s take a closer look at batteries this month and clear up some of the mystery surrounding the increasingly complicated choice of products. The kind of batteries that you keep in your kit can actually make a difference. There are so many different kinds of batteries out there with so many chemical names (alkaline, lithium, lithium ion, carbon zinc, silver zinc, nickel cadmium, etc.) that one almost starts to wonder if we should be checking for monosodium glutamate or partially hydrogenated oils! However, as a consumer with battery-powered radios and flashlights in an emergency kit, you really only have to worry about two of them: alkaline and lithium. First, it may go without saying, but don’t rely on rechargeable batteries in your kit! Not only is the whole idea to have batteries that you can use when there is no power to your outlets, but it’s also important to note that rechargeable batteries don’t hold their charge for long. The website of Energizer batteries estimates a loss of 1% of deliverable energy per day in storage when not being charged, so a fully charged and stored rechargeable battery could be dead just a few months later. Alkaline batteries are the ones you’ve probably used for most of your life, from Duracell, Energizer, and a variety of other brands. The most common consumer forms used in radios and flashlights are 1.5V in AAA, AA, and D sizes, and the 9V transistor radio style. 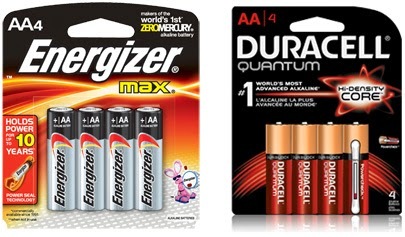 The shelf life of alkaline batteries has improved in recent years, and some of them, such as Duracell’s Quantum line with "Duralock Power Preserve Technology” and Energizer’s MAX line with “Power Seal Technology,” claim to have a storage life of at least 10 years. They pay someone to come up with names like these, don’t they? Recently, however, I’ve become very impressed with lithium batteries. Regardless of shape, lithium batteries used to be primarily 3V and therefore not a good replacement for 1.5V alkalines, but they have shown up in recent years in the familiar 1.5V AA and AAA styles. 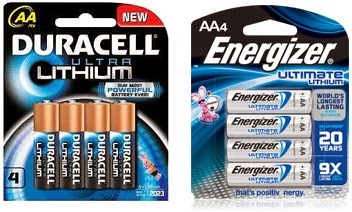 Both Duracell and Energizer produce these, as well as the shorter 3V CR123 lithium batteries that power some of the better LED flashlights. I’m sure there are other good brands out there, but I am focusing on the popular brands that are ubiquitous in stores. (I have no financial interests in either of these companies, nor in battery technology/sales.) In fact, I’ve switched all of the batteries in my emergency supplies to Energizer’s “Ultimate Lithium.” I chose Energizer over Duracell because their lithium batteries are easier to find in the stores that I frequent, and because Consumer Reports gave their top rating to Energizer Ultimate Lithium batteries in 2011. I like lithium for several reasons. First, they last longer in storage, which means less chance of opening your kit a few years from now and finding weak batteries if you don’t check your supplies regularly, and fewer rounds of replacement if you do check regularly. The package says that they hold power up to 20 years. “Up to”? What does that mean? Doesn’t 3 years fit the description of “up to 20 years”? Still, the helpful folks at Batteries Plus Bulbs confirmed for me that lithium batteries should indeed hold a charge in storage considerably longer than alkaline batteries. Second, the 1.5V lithium batteries are supposed to power devices considerably longer than 1.5V alkalines, even longer for the 3V CR123 style. Again, with the “up to” caveat, Energizer says its Ultimate Lithium batteries power devices up to 9 times longer than alkalines, and while the 9x figure is unclear, Consumer Reports agrees that lithium has considerably longer run time than alkaline. This means that your crucial use of battery-powered devices during extended power outages won’t be derailed nearly as often by batteries running out of juice, and you don’t have to store as many of the lithium batteries. Lithium batteries are considerably more expensive than comparable alkaline batteries, but the increased run time on a charge more than makes up for the added cost of purchase. Pair some lithium batteries with an LED flashlight and you have a longevity combination that would have Thomas Edison and Alessandro Volta giving each other high fives. An added benefit of the lithium batteries is that they are significantly lighter in weight than similar sized alkalines, which is a plus when you have them in portable emergency kits that won’t be as heavy. Furthermore, lithium batteries are less affected by extremes of hot or cold temperature, making them ideal for outdoor use and for unpredictable conditions under which you may need to use them during an emergency. Lastly, think also about replacing your 9V alkaline smoke detector batteries with 9V lithium batteries, some of which are marketed specifically for that purpose. They won't need to be changed as often as the alkaline batteries. While I am not aware of any downsides of using lithium versus alkaline batteries, the folks at Batteries Plus Bulbs told me that you should still try to avoid storing alkaline or lithium batteries in the devices’ battery compartments during long periods of non-use, due to increase potential for leaking when the circuit is almost complete. [1/12/19 update: I was just perusing Energizer's website and it says "Energizer® Ultimate Lithium™ Batteries are GUARANTEED NOT TO LEAK. Due to advanced technology, Ultimate lithium™ batteries will not leak under normal consumer usage. If you believe that you have a leaking Energizer® Ultimate Lithium™ battery, contact 1-800-383-7323 for return instructions."] They should still be recycled if possible, like alkaline batteries, although neither are as bad for the environment as the rechargeables. If you dump 3V batteries in a bag haphazardly for storage or a recycling container, the salespeople counseled me to tape the terminals because of the risk of a circuit forming in the bag and consequent overheating. Finally, just like the alkaline batteries, storage in the freezer or refrigerator is NOT recommended, as it’s an urban legend that these conditions increase shelf life, and the resulting condensation can actually reduce shelf life.